NCI, as Australia's national research computing service, provides world-class, high-end services to Australia's researchers, the primary objectives of which are to raise the ambition, impact, and outcomes of Australian research through access to advanced computational and data-intensive methods, support, and high-performance infrastructure. NCI operates as a formal Collaboration of ANU, CSIRO, the Australian Bureau of Meteorology, Geoscience Australia and the Terrestrial Ecosystem Research Network Ecosystem Modelling and Scaling Infrastructure (eMAST) together with partnerships with a number of research-intensive universities. NCI offers comprehensive and integrated high-performance services that cover the gamut of computationally-based research, but with a focus in the environment, and in earth system science in particular. Research Data Switchboard (RD-Switchboard) allows cross platform discovery by connecting data sets from multiple registries. 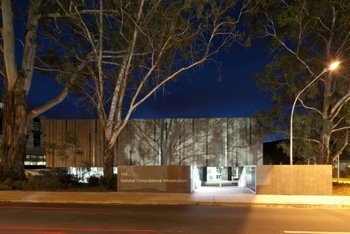 As an operating unit of the Australian National University (ANU), NCI can trace its lineage back to the ANU Supercomputing Facility, established in the late 1980s, and to the Australian Partnership for Advanced Computing (APAC), which provided the first national services from 2000-2007. Today, NCI operates as a formal Collaboration of the ANU-the national research university; the Commonwealth Scientific and Industrial Research Organisation (CSIRO)-the national research agency; the Australian Bureau of Meteorology (BoM)-the national meteorological agency; Geoscience Australia- the national geosciences agency; together with partnerships with a number of research-intensive universities, supported by the Australian Research Council. NCI offers comprehensive and integrated high-performance services that cover the gamut of computationally-based research, but with a focus in the environment, and in climate and earth system science in particular. The infrastructure investments, which total in excess of $80M since 2007, have been provided by the Australian Government under its National Collaborative Research Infrastructure Strategy (NCRIS) and Super Science Initiatives, and include a new 1.2 petaflop HPC system, a 3,200 core high-performance compute cloud, persistent disk storage of more than 10 PBytes (as at July 2013, and growing), and a new purpose-built data centre. Paralleling this is the considerable co-investment by the collaborating partners that collectively provide for all of the recurrent costs of the facility, the value of which exceeds the annualised value of the infrastructure. What truly distinguishes NCI, however, is the depth of its engagement with research communities and research organisations, and the collaborative development of research environments/digital laboratories to enhance research ambition and outcomes in areas of international significance and national benefit-all of which is built around an expert team acknowledged for its innovation and well-run services. Fill up the DMP online form or upload your xml file to save a DMP.
. the username entered if accessing a restricted site. The ANU uses this information for statistical purposes and for system administration tasks to maintain this service. We do not attempt to identify individuals as part of our regular business practices however in the unlikely event of an investigation, the ANU, a law enforcement agency or other government agency may exercise its legal authority to inspect our server?s logs. External sites that are linked to or from the ANU site are generally not under our control or responsibility and you are advised to review their privacy statement. The ANU is deemed an 'agency' within the meaning of the Privacy Act 1988 (Commonwealth) and as such complies with the obligations of the Privacy Act within that meaning. Except as permitted above you must not copy, adapt, publish distribute or commercialise any material contained on this site without NCI?s permission. Please note that the copyright in the materials appearing at Internet sites which are liked from this site, rest with the author of those materials, or the author?s licensee (subject to the operation of the Copyrights Act 1968). National Computational Infrastructure recommends that you refer to the copyright statements on those sites before making use of the materials.